Forming the American stage of the FIM Superbike World Championship, when the races come to the Mazda Raceway Laguna Seca the stage will be set for some fantastic racing from some of the biggest teams in the world. Attracting large crowds, visitors come from far and wide to see the spectacle and watch this part of the annual championship series. The weekend, September 27th – 29th, will hold two major races – and is the only chance for fans in the United States to come watch their favourite race, as this is the only American venue in the series. If you will be at one of the hotels around Monterey CA be sure to check out the race! The major manufacturers – including BMW, Aprilia, Honda, Ducati, Suzuki and Kawasaki – will all be in attendance supporting their teams and riders through the weekend’s events. The main draw to the FIM Superbike World Championship is the fact that their bikes are based on the standard, showroom models. Of course, they are tuned and tweaked to make them race ready – but in essence, the same bikes that race around the Mazda Raceway Laguna Seca track and the other venues in the calendar are the same machines which could be purchased by the public. Since 1988, when the Championship was founded, fans have loved watching the bikes with which they are familiar perform to the very top end of their capabilities. Going in to the American stage of the 14 stage season, the rider’s championship is being led by the UK’s Tom Sykes, riding a Kawasaki. He is followed by two riders on Aprilia machines: the French Sylvain Guintoli in second place and Ireland’s Eugune Laverty in third position. These three riders also held the podium spots in the second race of the Istanbul stage prior to the series’ arrival in the US, setting them up in competition for this weekend. Aprilia lead the manufacturer’s championship on 419 points ahead of second place Kawasaki on 377 points, followed by BMW on 354. 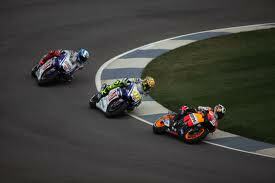 All this could change, however, as the riders prepare to race at the Mazda Raceway Laguna Seca. With just three stages left – America, France and Spain – the positions are still not settled and anyone could run to ultimate victory.